2. Saute the capsicum slices until tender. 3. Add the lamb mince, tomato sauce, garam masala powder and egg. 4. Cook for a minute and transfer to a bowl. 5. Mix well and shape the mixture into burger patties. 6. Heat the remaining oil in a nonstick pan over medium flame. 7. Fry the prepared patties for 3 to 4 minutes on each side until browned and cooked through. 8. Remove from flame and keep warm. 9. 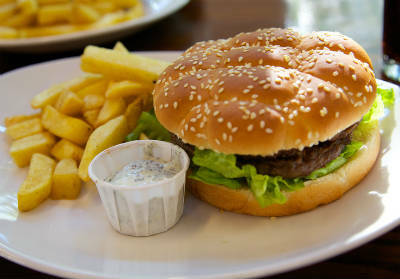 Spread mint leaves, cucumber slice, tomato slice and onion slice on one half of the burger bun. 10. Place the cooked patty on top and a cheese slice on top. Cover with the other half. 11. Serve at once with fries and dipping sauce. 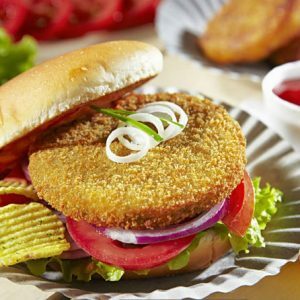 Feel free to comment or share your thoughts on this Spicy Lamb Burger Recipe from Awesome Cuisine.